Volunteerism – It’s Not Just a Job; It’s a Job Without a Paycheck. At about 3:45 pm on Tuesday, I dropped by the dubbing stage on the Disney lot, where Erik the recordist downloaded my conformed dialogue tracks. By 4:00 pm I was waving goodbye to my supervisor, my boss, the mixers and the producer of “Once Upon a Time.” I probably won’t see any of them again until season 2 begins next September. I love my job as the dialogue editor on the show, but with only 22 episodes a year, it leaves a very long hiatus. So on Wednesday morning I woke up and started my new job. I love this job too – probably even more than I love working on a hit show. And my new job pays nothing. When I say “nothing,” I don’t mean that it’s something close to nothing like minimum wage at McDonald’s. My new job pays nothing because for the next month I’ll be working as a volunteer. Since 2001 I have been a parent at Colfax Charter Elementary School in Valley Village. Back then, most families in the neighborhood sent their kids to private schools. They didn’t really know much about our little public school. So in 1998 when my daughter turned 2, I started volunteering at Colfax in an effort to infiltrate the school and see first hand what it was like. They placed me in a 1st grade class with a teacher named Paige Gage, and I fell in love. Besides having a name that rhymed (something every 1st grade teacher should have) she was engaging, fun, and she genuinely seemed to enjoy being there everyday with the kids. It turns out she was a parent there years ago and became a teacher later. Her children are now grown and she’s still at Colfax and teaching 2nd grade now. And I’m still in love with her. On Mondays and Wednesdays at 12:30 I get to help my son Jake and his classmates place their feet correctly on the Arthur Murray-like foot positions on the floor and keep the boys from having sword fights with the bows. 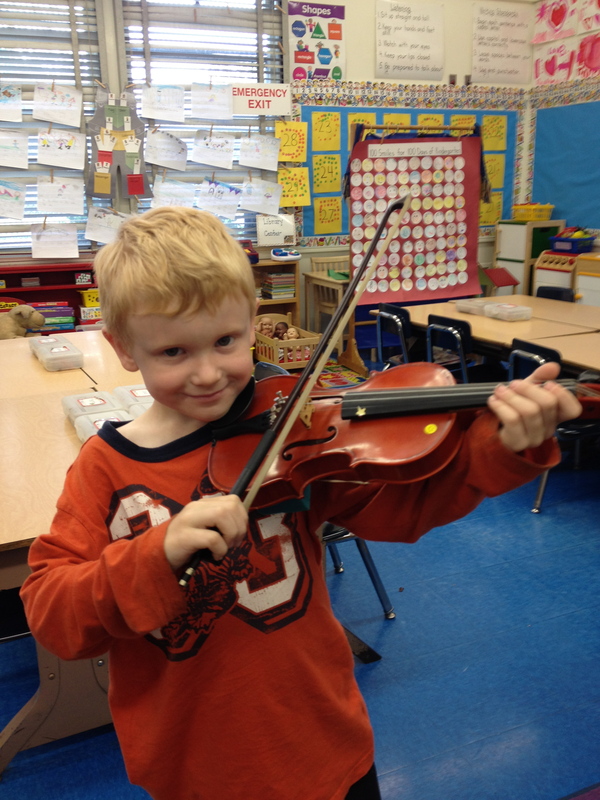 The kindergarten recital is May 24. For that day I’ll probably work as a kid wrangler and try to keep them from messing up their white button-down shirts. Good thing the recital is first thing in the morning or after recess I’d be racing home and washing a large load of white button-down shirts. 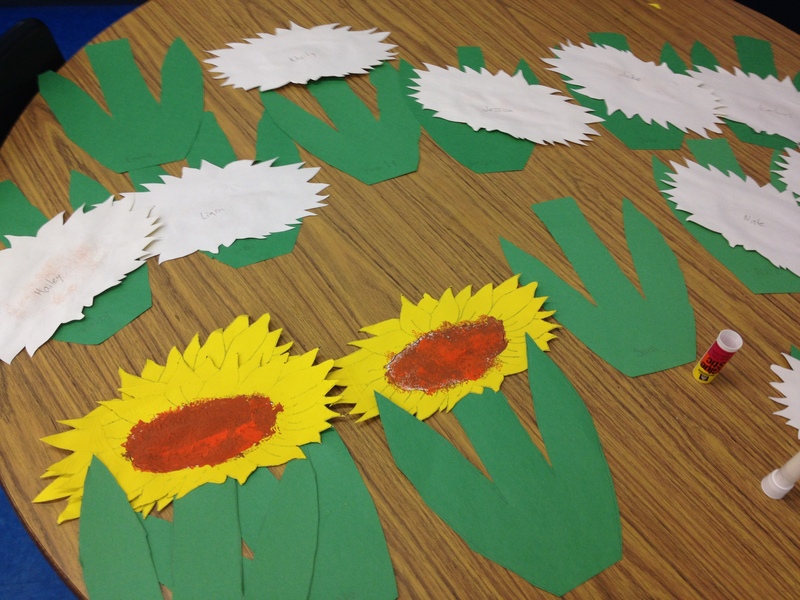 Today I helped the kids paint sunflowers. I let a girl named Emma make a second one after I totally screwed hers up by suggesting she fix a part of it. She was doing way better without my help. This Saturday, May 12th we’re all bringing our gardening gloves, rakes and creaking backs to the campus to sweep, clean and plant. It’s scheduled right between Jake’s baseball game and my niece’s baby shower in Yucaipa, so I can just spare an hour. That’s how long it should take to clean up 10 square yards of an area covered in juice box straw wrappers. Damn Juicy Juice. May 17th I get to see who’s going to be Co-VP of Communications with me. The term will be up for my current partner Joanne, which is really scary since she’s the one who takes the great photos and sends out the Constant Contact email messages to the whole school. I’m crossing my fingers that the new Co-VP is artistic and tech-savvy. Otherwise I’ll need to learn how to take photos where people actually have their eyes open. I’ve signed up to bring lasagna. I used to make an amazing lasagna before I had kids. Now every year I sign up to bring a lasagna to the Teacher Appreciation Lunch with the intention of making a homemade one, and every year I realize that an amazing lasagna takes about half a day to prepare. I’m thinking of just cooking a Stouffer’s in one of my Corningware trays so it looks like I actually spent more time on it than merely turning an oven dial. Every year, that same teacher I volunteered for back in 1998 puts on a Vaudeville Show. Starting in January, Paige Gage has rehearsals every Wednesday afternoon not only for her 2nd grade class, but she also offers it to every 2nd grader in the school and any older student who wants to help with the show. I’m the gal who gets to press “play” on the iPod. The kids sing songs like Jimmy Durante’s Inka Dinka Doo, perform magic tricks, and tell really corny jokes. I’ll hear the words “knock knock… who’s there?” more than any sane person should hear in a lifetime. I have the opportunity to make three 20-30 minute presentations on what a sound editor does for a living. After I explain that I work from home and wear headphones all day, the kids who will decide to pursue this career when they grow up will either be sound aficionados or anti-social shut-ins. During the very last PTA/PACE meeting of the year we have a presentation to say goodbye to all the 5th grade parents who have gone above and beyond in volunteering for the school. I have the dream-of-a-lifetime job of writing a bunch of parodies and having some of the 5th graders perform it that night. My goal is to make the parents simultaneously roar with laughter and weep like babies. (Have some fun and check out last year’s karaoke version at Colfax 5th Grade Tribute 2011 on Youtube). This is the Big Kahuna of my volunteer activities, which is fitting since one of the things I get to hype is the Big Kahuna – a huge water slide at the Colfax World Fair on June 2nd. Last year about 7,000 guests attended this event which made $140,000 in a single day. My job is to get the news out about the fair by any means possible and to make enough money to keep all of Colfax’s extracurricular (and curricular) programs alive. I have a great team of volunteers working with me this year who will be spreading the word with Facebook, Twitter, Patch, emails, banners, posters, car magnets, flyers, postcards, lawn signs, newspapers, magazines, radio, online or just good old fashioned word of mouth. 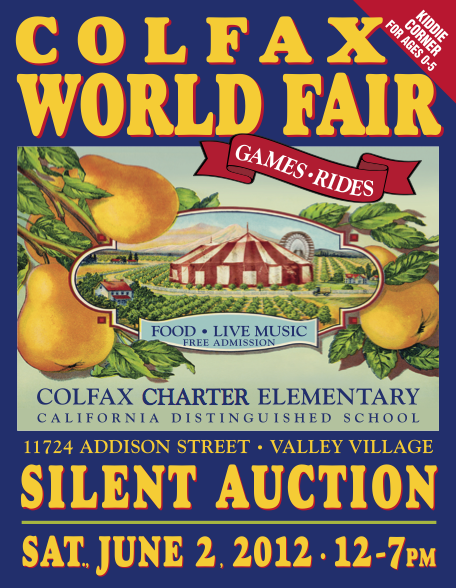 By June 2nd, if you haven’t heard of the Colfax World Fair, it means you’ve been in a coma under a rock on a desert island. 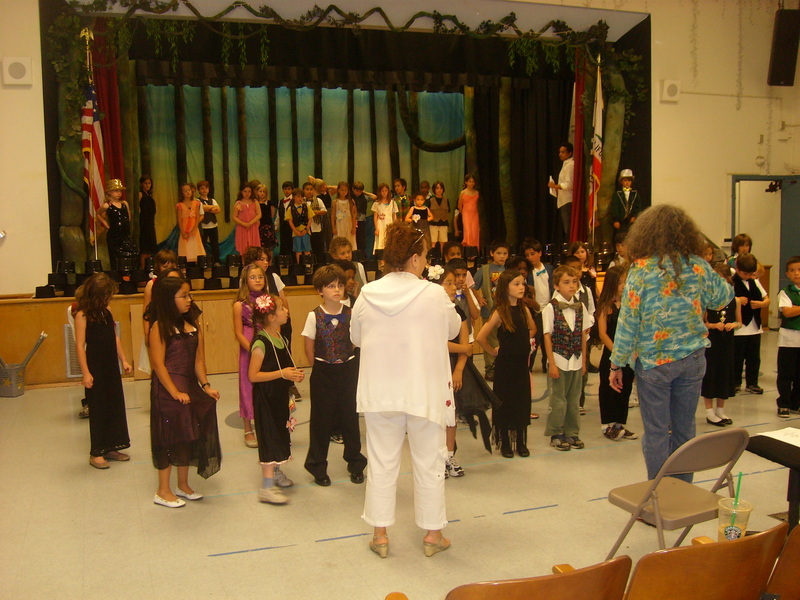 Tuesday, June 19th is the last day of the 2011-2012 year for this little LAUSD school. So at 1:30 pm I’ll be clocking out. By then I’ll need a nap. My wife thinks I am funny. She usually counts on me to write some funny reply to her blogs. This is a really nice blog about her engagement with Colfax. The only thing funny here is she thinks she will take a nap when the school year is over. You have to sit still in order to take a nap and she won’t do that. I work full time so I don’t get to volunteer much. I always help with the fair and I am a member of PACE, the parent booster club. I did volunteer a couple of times last week while on vacation. It was surprising to see how much it meant to my son to see me there and helping his class. He is 5 years old so he still likes being seen publically with his parents. I am not an embarrassment to him yet. I only embarrass Jake if I kiss him in public. So I try to do it as often as possible. Bravo for being so involved, I bet you help make a lot of things possible that otherwise wouldn’t be! I love to say to new parents how amazing it is that you are destined to be best friends with people you have absolutely nothing in common with except you have kids the same age. Good luck with kindergarten. I’m thrilled that you plan to get involved. Thank you! I’m pretty excited too. Happy Mother’s Day! 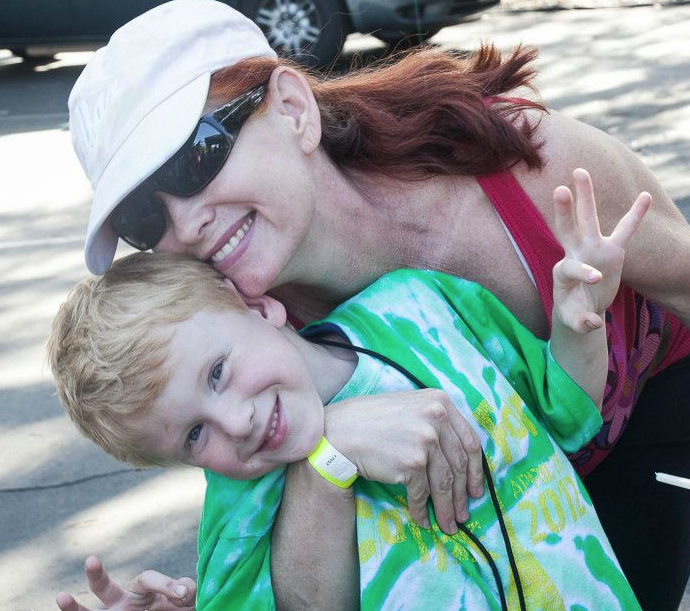 I volunteered at my son’s school when he was the same age as your son. He is getting married in three weeks and two of his groomsmen are boys that I met back then. It’s wonderful to get to know the kids your kids grow up with! That is so sweet! I joke with Jake that he’s going to marry Sasha, a girl in his kindergarten class. My husband and Sasha’s dad are both co-PTA treasurers and Sasha’s mom and I are room parents in the kindergarten class. Wouldn’t it be funny if Sasha and Jake were like your son and his friends remembering way back when? I laughed when I read your title. I volunteered in schools for a couple of decades and eventually ended up teaching sixth grade. I’m taking a little time off now and was thinking about volunteering again until I read your post. On behalf of teachers (and kids and parents) everywhere: thank you!!!! And Happy Mother’s Day! I love that you ended up teaching. We have so many teachers at our school who used to be parents there, and about a third of our teachers have children who have either gone or currently go to our school. It feels like a small town, without all the negatives of a small town. Please don’t let me discourage you from volunteering. I’ll bet you’re great at it.